The current-sensing preamp design has the claimed advantage that it makes the circuit independent of microphone impedance, so performance loss due to less-than-optimum impedance matching should be eliminated. 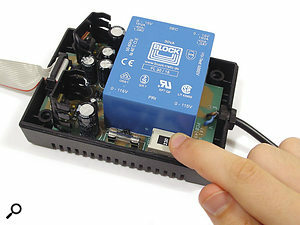 Furthermore, because the circuit works on current rather than voltage, there's no hum or noise when the input is disconnected — an infinitely high impedance results in an infinitely low current, effectively muting the circuit. Unusually, the circuit comprises six separate gain stages offering up to 65dB of mic gain, and one of the well-known advantages of distributing gain rather than applying it all in one place is that the noise performance is generally better. 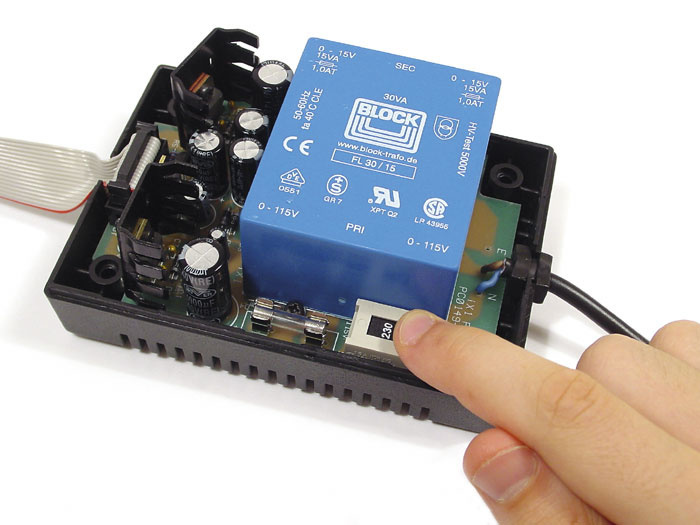 The mic amp has a nominal 1kΩ input impedance, while the line input is set at 20kΩ. Each amplifier is built on a separate circuit board, with a smaller daughterboard mounted at 90 degrees to it to carry the metering circuitry and LEDs. The rear panel has balanced jack line inputs, balanced XLR mic inputs and balanced jack outputs for each of the 16 channels, though the line input may be used unbalanced simply by inserting an unbalanced jack. The front-panel controls comprise a gain control with up to 65dB of mic gain and 20dB of line gain, separate phantom power switching, a 75Hz high-pass filter switch, a phase-invert switch and a 26dB pad for each channel. The phase invert applies to both mic and line inputs, and it is possible to use the mic and line inputs of a single channel together, though their respective levels must then be adjusted at source. 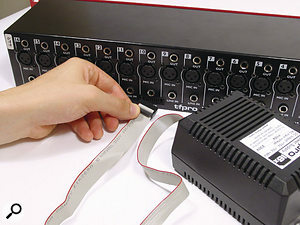 However, it is unwise to leave the line input connected to other equipment when using the mic input, due to the risk of feeding unwanted noise into the system. The nominal output level of each channel is +4dBu, and the metering comprises five LEDs with a maximum reading of +12dB. 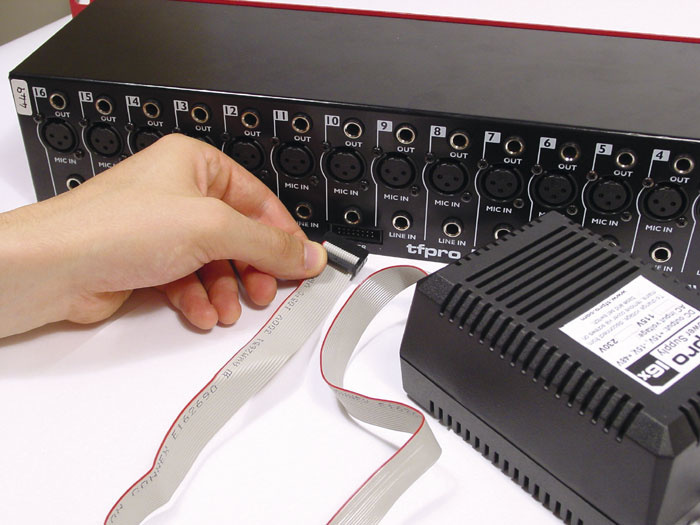 Unusually, the 16X's PSU attaches to the rack unit via a ribbon cable and a small plastic multi-pin plug.Photo: Mike CameronI tested the 16X when doing some guitar and voice recordings for a friend, and it turned in great results. I don't think the design has the same finesse as my SPL Channel One mic preamps, but then there is a huge price differential! Technically and subjectively, the 16X scores well where it matters, though I'm not entirely convinced that it justifies the cost per channel, as you could buy a complete mixer with 16 very respectable mic preamps for less money in the UK. The circuit certainly claims very low distortion (less than 0.001 percent THD) and its frequency response is very flat over the critical 20Hz-20kHz range (±0.5dB). Its maximum output level is 24dBu, which is always good news for those feeding greedy soundcard or digital recorder inputs, and the quoted noise performance is 126dB EIN, which is very typical of the majority of decent mic preamps. Other factors influencing the sound quality can reside in the gaps between the quoted figures, but in all real-life applications I found the 16X worked very well, and it's certainly as good as, if not an improvement upon the mic amps found on most respectable project studio mixers. In fact my only dislike, besides the UK price, is a practical one, and that is that the cable on the PSU wasn't long enough for me to put the 16X Mic Preamp at the top of my rack while leaving the power bulge on the floor. Being able to buy multiple mic amps in a compact format will be welcomed by project studio owners of all kinds, from those needing to record multiple simultaneous sources into a computer sequencer to owners of hardware recorders. The 16X could be particularly useful in live recording situations, though you'd still need a simple line mixer for monitoring. You don't get the EQ and compression found in typical voice channels, but in many instances it's better to add that when mixing anyway, so at the recording stage a clean simple mic amp is often the best and most practical solution. I like both the concept and the performance of the 16X and look forward to checking out future product releases from TFPro. 16 good-quality mic preamps in a 2U space. External PSU is a little clumsy, particularly for mobile work. While the mic preamps are very good, I still find it difficult to justify the cost of this unit. The 16X mic preamp is a conceptually simple, but very practical way of adding multiple mic amps to a studio or portable recording system.